Measurements: 2.75 x 4.6 inches, or 70 x 117 mm. Back of card: Just like the front. Same ornate scrollwork (even the details). The arch across the top is reflected across the bottom. The colors are identical. The only change, from the front to the back, is in place of the central colored squib featured on the front, on the back there is two vague, butterfly-like abstractions. May be inverted, but does not contrast well. Book included: Yes, 284 pages, 5.2 x 8 inches, or 13.2 x 20.2 cm. Illustrated, in English only. Comments: Llewellyn has always had a keen sense of what would sell, of what the public would want. 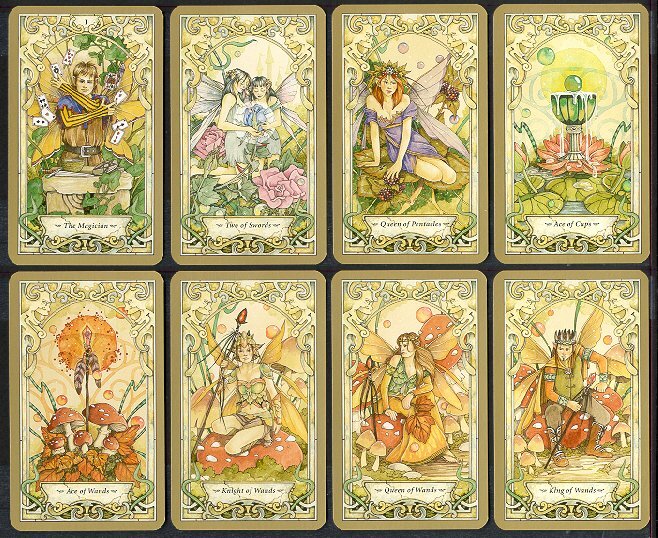 And so we have another fairy tarot. This one, frankly, did not interest me. One day a young, beautiful and adventurous water nymph heard of the magical celandine with its promise of true love and went in search of it. Likewise, an equally young, handsome, adventurous young wood elf did the same. They discovered each othe, the magic celadine, and a bubblelike pearl at the same time. Although they were from different races, she accepted the pearl when the elf offered it. Convinced of the legend's truth and promise, they pledged their love and commitment to each other. You are at the beginning of an exciting partnership, romantic or otherwise. Everything feels magical and wonderful. Enjoy this time to the utmost, and store up the memories of it. The happiness of this period will give you strength through the harder times. You are finding it easy to make promises and vows right now. These memories will help you keep the promises later, when you may wonder why you ever made them. There are no inverted delineations. For another, possibly more realistic view of fairies, see the short story by H.H. Munroe, "Saki" (1870-1916), entitled, The Music on the Hill.